Pipette.com, major distributor of liquid handling products, has announced their extension of promotions on multichannel pipettes. The promotions will help labs increase productivity. Pipette.com, a comprehensive and user-friendly online one-stop shop with over 20 different brands of liquid handling products, has extended their multichannel pipettes promotion. This will benefit labs who wish to increase their throughput. Pipette.com has almost two decades of providing dependable and affordable pipettes, pipette tips, and calibration service. Their expertise and high quality products enable users to find the correct multichannel for them. 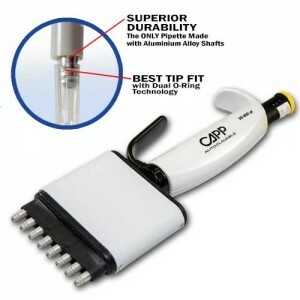 Their multichannel pipette promotion is now available and accessible on their website. It includes multichannel pipettes from Eppendorf®, Biohit® and CAPP® brands. On average, this promotion will save customers 20% of the original price. Some of the skepticism behind switching over to a multichannel pipette is due to concerns about the weight, tip fit and precision of the pipette. However, the technology behind the multichannel pipettes have come a long way since its first construction in the early 1970s. The Eppendorf Research® plus multichannel pipette is ultra light and is renowned for its robustness. It is available in 8- or 12-channel and is resistant to thermal, chemical and mechanical stress. In addition, CAPP is the innovator of the first fully autoclavable multichannel pipettes. Their innovative double O-ring technology provides easy tip fit to ensure further precision in any research. With the double O-ring technology, technicians no longer have to jam tips to ensure that they stay on the pipettor. The CAPP Aero multichannel is available 8-, 12-, 16-, 48-, and 64- channel. The Biohit mLine® multichannel pipette is also available in 8- or 12- channel and features the lowest pipetting force on the market. It has a high chemical and UV resistance. All of these multichannel pipettes are designed to increase productivity without decreasing precision and the risk of RSI injury. With years of experience, Pipette.com continues to provide the highest quality products and services in one comprehensive website. For those interested in knowing more about CAPP’s dual O-ring and its tip fit advantage, read CAPP Multichannel Pipettes Increase Productivity in Labs. Accelerate your labs throughput by visiting the pipette multichannels page and schedule a demo or purchase a multichannel pipette, today! To schedule a demo of a specific pipette, call 800-243-3232 or send an email to info(at)pipette(dot)com. Questions, concerns and other inquiries can be addressed to the company directly.